It would seem as if casting real people to play themselves in docu-drama movies is the big trend in 2018. Clint Eastwood did it with disastrous results with The 15:17 to Paris. 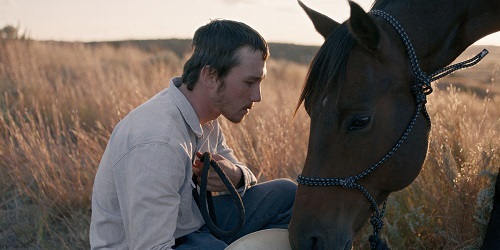 Now, director Chloé Zhao has done it with The Rider. The results are better, but they’re still not exactly good. The Rider is about a rodeo cowboy named Brady Blackburn (played by the film’s inspiration, cowboy Brady Jandreau) who is recovering from a devastating head injury that he suffered while competing. Brady wants nothing more than to get back on a horse, but with doctors advising against it and his unsupportive father, Wayne (Brady’s father, Tim Jandreau), hounding him to quit, it seems like a long shot. Inspired by his best friend, another rodeo cowboy named Lane Scott (played by the real Lane Scott) who also suffered a catastrophic injury, and encouraged by his developmentally challenged sister, Lilly (real sister Lilly Jandreau), Brady has to decide whether to risk doing the only thing he’s ever wanted to do, or settle into the humdrum world of normal life. Chloé Zhao first met cowboy Brady Jandreau while making her first feature, Songs My Brothers Taught Me, in 2015. The next year, Jandreau had the horrible accident depicted in The Rider. Zhao had already wanted to put Jandreau into one of her movies, so when he came back from his injuries, she decided that the story that needed to be told was his own. And it is a compelling story. The movie is just hindered by its inexperienced cast. The Rider is a very well-put together film, both aesthetically and narratively. The movie looks beautiful, thanks to the stunning South Dakota locations and the sweeping cinematography of Joshua James Richards (God’s Own Country). The script, which Zhao wrote herself based on Jandreau’s story, is well paced and engaging. And The Rider has the best use of hairstyles to show the passing of time this side of Miles Ahead. But, unfortunately, the acting, which displays no middle ground between glimpses of brilliant and piles of dreadful, distracts from all of that. To its credit, The Rider does not beg for sympathy, nor does it portray Brady as a hopeless fool. It’s a very honest movie, a trait that probably stems from Zhao’s closeness to the subject matter. It reeks of authenticity, for both better and for worse. It’s both uplifting and heartbreaking. There are bits that come off as exploitive television re-enactments, but most of the movie seems like an organic look at a guy whose athletic career ended in his prime. It’s like rodeo’s answer to The Wrestler. Except Brady Jandreau is no Mickey Rourke. All things considered, The Rider is a better movie than The 15:17 to Paris. It’s actually a much better movie than The 15:17 to Paris. But that still doesn’t mean it’s great. It’s a shining example of how one bad ingredient can spoil the whole stew. The acting in The Rider is either incredible or horrible, and it’s hard to tell which is which. Most of the characters are wooden and emotionless, which takes the audience out of the story, but seeing as how everyone is playing themselves in the movie, that may just be how they are. Whereas one got the feeling with The 15:17 to Paris that the “actors” were intimidated by the legendary Clint Eastwood, The Rider just feels like the characters lack charisma and charm. Brady Jandreau does have a few shining moments, but they only serve to frustrate the audience, because they provide a glimmer of hope that the movie’s acting will get better, and it never does. It’s a little unfair to criticize people who are playing versions of themselves, as that’s the one role that they have been born to play. But, with how great The Rider looks and how powerful the story is, one can’t help but imagine how good the movie would have been had professional actors been used.